There is an art to running a cafe for the early commuter crowd. Opening up on the correct side of the road is generally important, as is making coffee and actually being visible. Choosing somewhere busy enough is another. Dopstop is a coffee cart on the inbound side of Gympie Road outside of an Indian restaurant that does fit these criteria quite well. 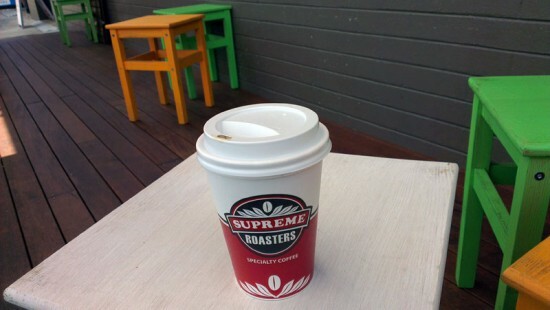 Dopstop uses Supreme Roasters coffee beans, which seems to be working for them as the coffee is rather good. The long black I tried had a slight cocoa, bitterish flavour with little aftertaste. I also tried an iced coffee they make themselves on a Tanzanian single origin. Unlike most it was not overly sweetened, and that’s another reason why I liked it. The cafe itself is a coffee cart set up on a small raised area just off the footpath. As focused as its setup is towards takeaway customers, there is also a collection of benches and stools just off to the side. Unsurprisingly there is a bit of road noise, though this was not enough of a reason to just get my coffee and go. The guy who was running the cart is worth stopping to chat with as he’s fairly knowledgeable about coffee, and Dopstop even made the Beanhunter best 2013 Brisbane cafe list at 83. Like it? Share it! Or not.